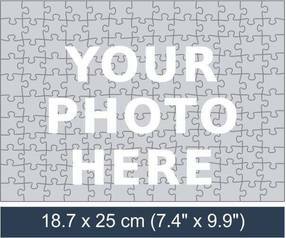 Personalised jigsaw made from your photo. Turn your photo in to jigsaw puzzle. Make Your Loved Ones Happy With Unique Personalised Jigsaw Puzzles! If you have been looking for a perfect gift for your loved ones, then look no further as you have reached the right place because nothing says love like a personalised jigsaw puzzle. The process of making one is just within the reach of your fingertips! Yes, it’s that easy. 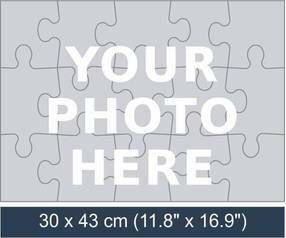 Just upload a memorable picture, sit back and relax as our team will get on to creating a marvelous customized jigsaw puzzle. To start creating your photo jigsaw puzzle select jigsaw size and upload a photo, design or artwork! The history of photo jigsaw dates back to the 1760s. Once used as educational toys for children, they have transcended into enduring entertainment for children and adults alike. How easy it can be to sit in a cosy room, working over a 1000 piece (or any other) puzzle. The fun can go on for hours or days as the image slowly emerges. You can turn your photo into a jigsaw puzzle! Imagine turning a treasured photo into a jigsaw puzzle and spending hours assembling the puzzle pieces into the picture of a favourite family member or a happily remembered vacation. Your customised photo jigsaw can seemingly bring that person or experience alive again as if the visit or occasion were only yesterday. Personalised jigsaw puzzles aren’t just made for family occasions; they can be excellent fundraisers for a school, a special-needs service (such as a not-for-profit animal rescue group), for team building activities, or for any other special purposes. 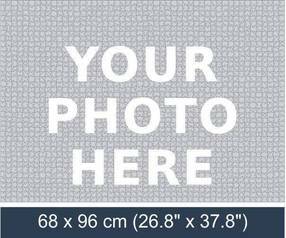 Are you an artist or photographer searching for some unique way to showcase your artwork? Consider turning your art into jigsaw puzzles to help capture the attention of prospective buyers and reviewers. 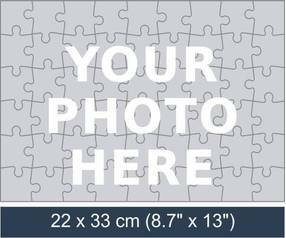 Your custom made photo jigsaw will be like any store-bought jigsaw puzzle – almost. What makes your jigsaw puzzle unique is that the printed image will be your own picture, design, artwork or message. You customise how you want the jigsaw to look, from how the image is placed on the puzzle’s surface to the puzzle size and piece count. You can choose from our 12 standard puzzle sizes; 1 of the 12 puzzle sizes is sure to be perfect fit for your personalised gift. PuzzlesPrint combines state-of-the-art production processes with high quality materials to ensure that finished puzzles are as beautiful and durable as possible. The cardboard used for our jigsaw puzzles is specially made for that purpose; the pieces are die cut, they are crisp, with clean edges. Customised jigsaw puzzles made by PuzzlesPrint are crafted to provide years of pleasure and use.